C54 Looks Set For An Easter Launch! Our roving reporter couldn’t resist sneaking up to Thorpe last week and taking a look at C54 in person, and what a wonderful sight she is. 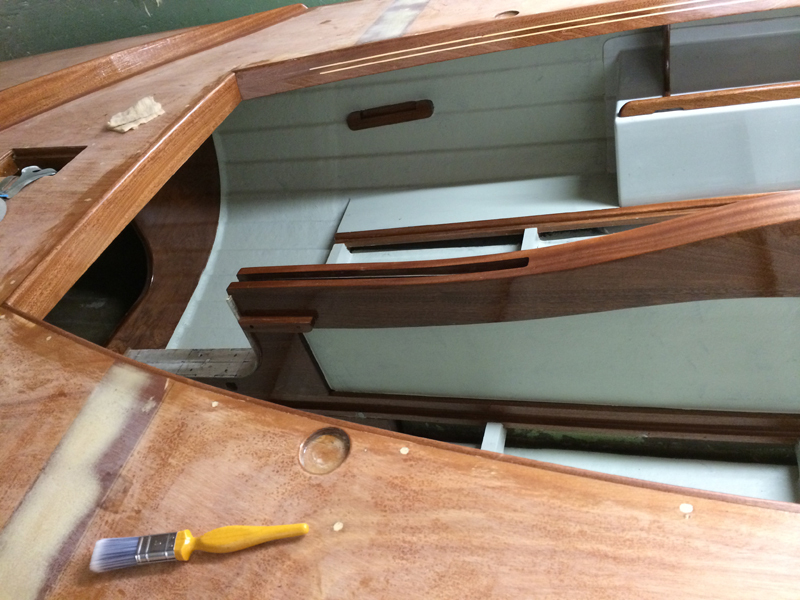 Simon Hipkin is doing a fantastic job of the joinery and finishing work and we can now see that the new moulded tanks are perfectly proportioned and make a great addition to the boat, as well as speeding up the production process. During our visit the second coat of epoxy was being applied by Simon and his assistant (its a two man job to work fast enough to ensure a good finish before it cures) and she was really starting to look more like a BOD and less like a work in progress. 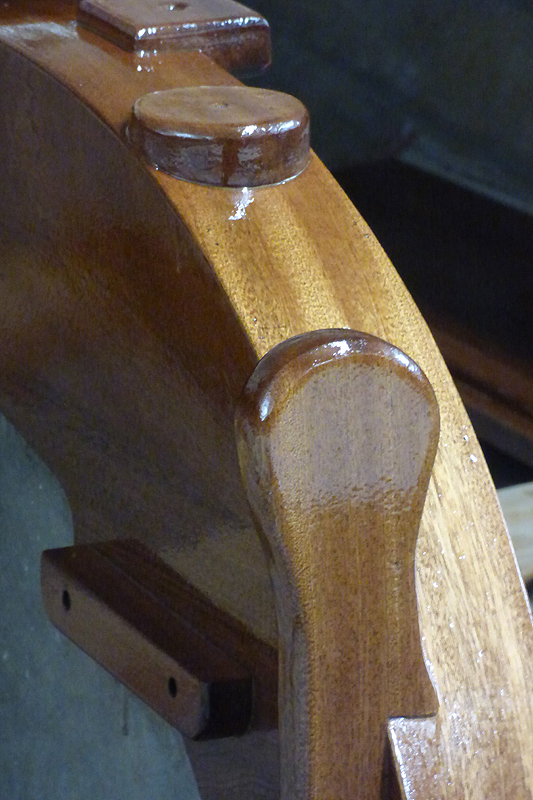 The attention to detail is stunning with every piece of timber perfectly matched and finished, even down to the addition of a pair of elegant inlaid pale sycamore detail lines to set off the rich mahogany of the cockpit combing. 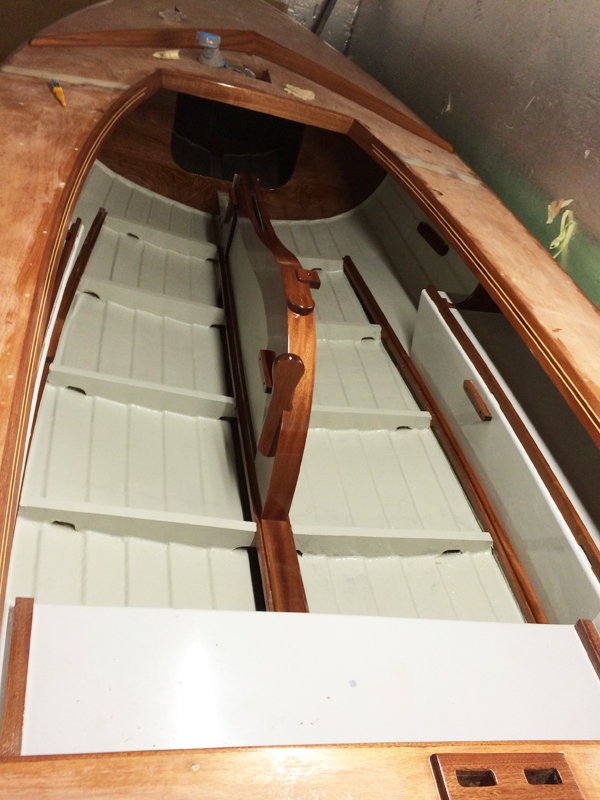 Shortly after our visit the bare fibreglass surfaces inside the boat were flowcoated and as you can see from the series of pictures below (thanks Alan for the extra photos) the interior of the boat is now starting to look very beautiful indeed. 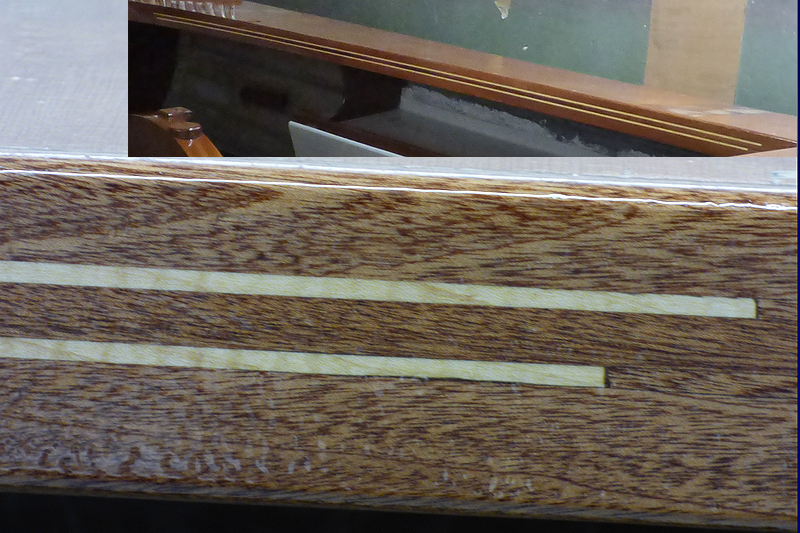 These photos also really help to show off the lovely job that Simon and Rob did of creating the mouldings for the tanks. 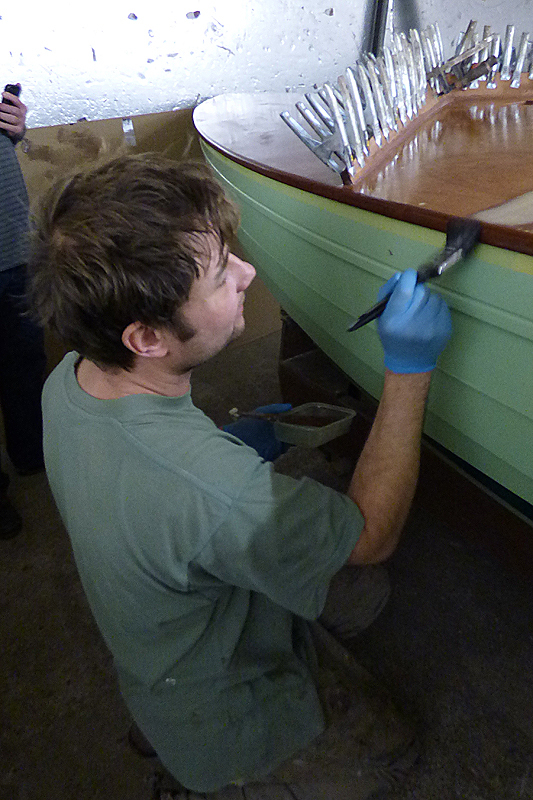 Next up will be deck paint and varnish and within days she should be back in Brightlingsea ready for Alan to start screwing on fittings. 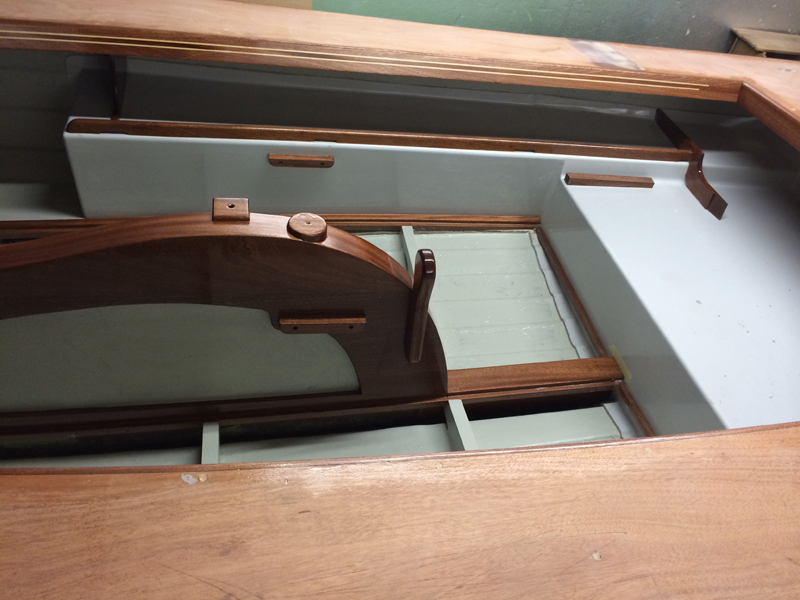 As soon as C54 goes out of the door C55 will be sent over to Simon so he can get her joinery and finishing completed too. Alan has set himself a launch date of Easter so stand by for an invitation to the launch event soon!